for the (then) current employees of the Martin Guitar Co.
manufacturer's serial number. 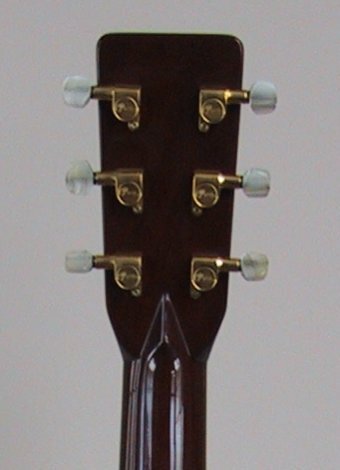 It also reads "Custom built for David Jeffrey"
have what has become known as a "square" headstock. compared to a "rock" or "folk" acoustic. It is definitely not a Bluegrass instrument, not that there is anything wrong with that! has not been subjected to any strong temperature changes and has only been used in the recording studio. History of this instrument: In 1983 Martin stamped the inner back strip of their instruments with a “wood burn” that reads 150th anniversary. This stamp was applied to all instruments produced by Martin in 1983. These instruments are not the “official” 150th anniversary Martins, they are standard production guitars with a woodburn mark. To celebrate their 150th Anniversary Martin decided to offer 150 Custom Shop Anniversary guitars. 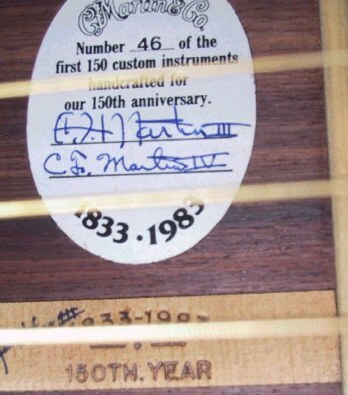 These 150 guitars are the “official” Anniversary Year Martin instruments. There are no two identical models since they were all Custom Shop models. 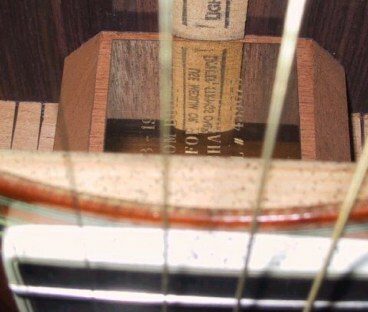 These 150 guitars have a white elliptical label on the inside back of the guitar (see photo) and they are sequentially number 1 of 150, 2 of 150, etc… My guitar is number 46 of this set of 150 guitars. In addition, my guitar is hand signed on the backstrip by C.F. Martin III (now deceased) and C.F. Martin 4th (current C.E.O). The elliptical label is also signed by both C.F's. 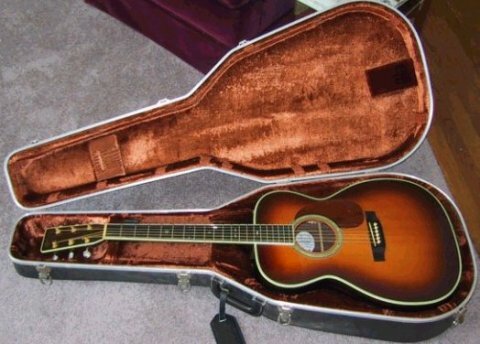 This guitar shares a rare place in guitar history since no other American guitar company has yet to celebrate a 150th anniversary, it is truly one of a kind.